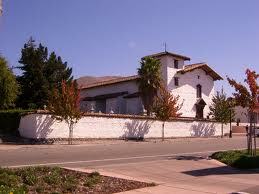 Mission San José was founded 11 June 1797 (14th in order) by Padre Fermin Francisco de Lasuén. The mission is named for Saint Joseph. The Indian name was Oroysom. The adobe church stood until an earthquake destroyed it in 1868. A wooden church replaced it. This church was moved to Burlingame in 1982. A 1985 restoration then completed work on the “original” Mission San Jose. Mass is held at 8:00 am, Monday through Friday. Enter through the Mission graveyard.